To celebrate the upcoming America Saves Week, America Saves is launching the #imsavingfor contest. It’s easy to enter. 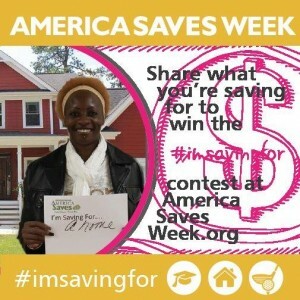 Just share a picture of you and what you are saving for and then enter to win $500 at AmericaSavesWeek.org/imsavingfor. Get creative with your pictures! Only one entry per person, but you can get an extra 3 entries by taking the next step in saving and completing the America Saves Pledge. After you enter, look for an email with your bonus opportunity information.